The transmission and distribution lines carrying electric energy are terminated at the substations. 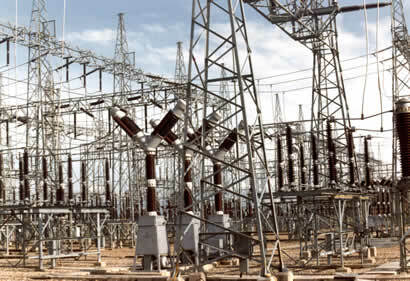 One substation may be connected to one or more substations by transmission lines or to a generating station. These lines operate at voltage levels as adopted by a particular region or nation. An actual transmission substation is shown below. Need for connecting a generator to the transmission system: We have already discussed that generators generate electricity at a low voltage mostly below 22 kV. But bulk quantity of power can be transmitted to very long distance only at high or extra high voltage. So generator transformers (GT) are used at the power station to step up the voltage to transmission level. 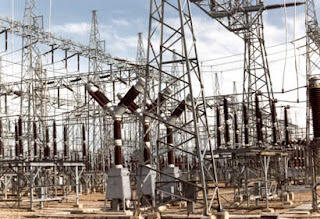 Here the substation is not a separate entity rather it is switchyard of the Power Station. These substations are quite complex. One can find here more numbers of transformers in comparison to other types of substations. To inter-connect two or more transmission lines at two or more different voltage levels: In a transmission system it is often planned or it is required to facilitate power flow between transmission lines at different voltage levels. These are transmission substations. Inter connecting Transformers (ICT) are used for this purpose. The transmission substations operate at Extra High Voltage (EHV). See Figure below. To step down the voltage to a lower level for further transmission (sub-transmission) at an economic rate: Sometimes for shorter distance transmission of comparatively less power, the transmission company may feel that it is economical to transmit at a voltage level in-between the standard transmission and distribution level. Hence the requirement of establishing the substation. To step down the voltage to a lower level for feeding a high voltage distribution network: These are the substations where the voltage is stepped down to a voltage level suitable for forming the major distribution network for a township. Step down to low voltage for supply to consumers: These are area substations, where the voltage is again stepped down to a level suitable for house holds consumption. 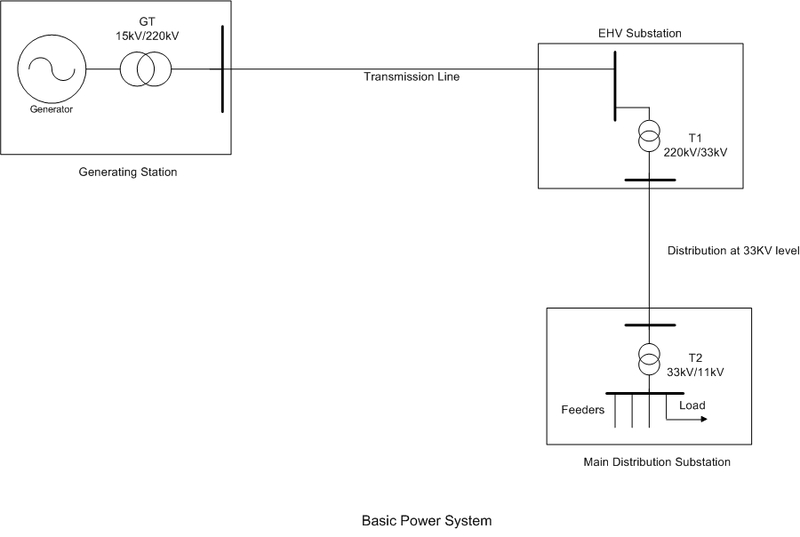 HVDC substation: There are two main purposes of a HVDC substation. 1) Two dissimilar systems with different frequency can be connected by HVDC link to facilitate power transfer from one side to the other side. 2) Direct current long distance bulk power transmission. HVDC substations have many advantages. Switching substation: These are the substations meant for switching purposes only. The Switching substation does not have a transformer. In a power system these are few in numbers. The switching substations are meant for disconnecting and connecting a part of network and facilitating maintenance works. Here I reproduce the SLD of a basic imaginary power system where we can see few types of substations and their relative configuration. A substation may not be exclusively for one of the above purposes. A substation may be established primarily for the purpose of bulk power transmission but at the same time may have another transformer installed for stepping down the voltage to a lower level and distribute locally. Sometimes any combination from the above is adopted depending on the requirements. The substations can be Air Insulated Substation (AIS) or Gas Insulated substation (GIS). It can be over ground or Under ground. The other important major elements usually found in the substation are Capacitor bank and Reactor. A substation has switching arrangements to connect or disconnect these high voltage equipments or elements to the system. Some important functions that are carried out in the substation are controlling the flow of energy, VAR compensation, voltage control, power factor improvement and measurement and recording of system parameters and initiating proper action. The switching arrangement is chosen as per the requirement. A substation has many equipments, some of these are circuit breaker, isolator, current transformer, potential transformer, surge absorber, measuring and recording instruments, relay and protective devices, batteries, battery chargers, fire fighting equipments etc. The substation transformers can be connected several ways. We have already discussed about transformer connection and Vector Group. We will discuss about all types of substations in future. liκе уour ωay of bloggіng. anԁ tell me your oρinion. The different voltage levels are required for certain generating units. All of this affects the transmission and distribution of the energy within the substations. These technical details had been of great help. Thanks for sharing! !Keep updating new posts on your blog!! That is so difficult for me to sort out the things that you gave here. Excellent blog I visit this blog it's really awesome.The important thing is that in this blog content written clearly and understandable.Content of information is very informative. Thanks for excellent and great idea.keep blogging!